Mr Key issued a statement today about his plans to attend the forum in Vanuatu from August 3 to 6 without mentioning Fiji -- the coup-stricken country which has dominated recent forum meetings. Deepening and strengthening New Zealand's relations with its Pacific neighbours was a high priority, he said. "The annual forum leaders' meeting is the main event in the Pacific calendar. It's a valuable opportunity for regional counterparts to discuss how we can work together to address the issues and challenges facing our region," he said. "Delegates at this year's forum are expected to discuss improved development assistance through the implementation of the Cairns Compact on Strengthening Development Coordination in the Pacific." The compact was agreed to at the forum in Australia last year. 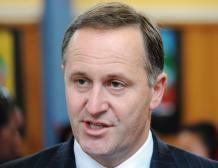 Mr Key said other topics would be the Pacific's response to the global financial crisis, and social and economic issues. Progress in reaching United Nations set goals on poverty reduction, fostering growth, and addressing maternal and child mortality, would be considered. "As a key donor as well as member of the region, New Zealand is strongly supportive of efforts to ensure our development assistance makes a real difference to the people of the Pacific." Following the leaders' meeting a "post-forum dialogue" meeting would allow forum countries to engage with non-member nations on topics ranging from security to development.